Goods remain the property of VestGuard UK Ltd until full payment has been received, except for UK Government agencies where ownership of goods passes over Ex Works. Body Armour equal or higher than NIJ Level II (2) is subject to an export licence to ship to any destination outside of the European Union. Body Armour equal or higher than NIJ Level IIIa (3a) is subject to an export licence to ship to any destination outside of the UK. UK Government Agencies working in any UK diplomatic mission or consular post. Special offers are subject to availability at the time of order. Special offers are for customers buying through our website or for full retail price purchases via email or phone. Special offers may be removed from our website at any time without notice. VestGuard accepts most credit and debit cards for phone and online sales. For security reasons VestGuard can only accept cards which are registered to the delivery address which has been provided. 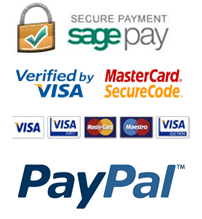 We currently accept card payments for UK deliveries only. Card payments can be made via any bank in the world or online into the corresponding VestGuard bank account stated below. The transaction is easy, fast, and instantly appears in the account. Postal Orders are accepted made payable to VestGuard UK sent to our head office address. Goods are shipped on receipt. Cash can be sent through a secure method to our Sales Office address. This method is not recommended for UK or international customers as no responsibility can be accepted for loss of funds during transit. Cheques are accepted and made payable to VestGuard UK either paid into our account or sent to our head office address. Please allow up to 5 working days for the payment to clear before goods can be dispatched. Bank transfers can be made from anywhere in the world into the VestGuard UK bank account. Please allow up to 5 working days for the payment to clear before goods can be dispatched. Proof of payment may be required. Please contact a member of the team for further information, details can be found on the contact us page. Any bank charges that are applicable shall be paid by the customer. Failure to pay any charges may cause a delay in the dispatch of the order. VestGuard operates on a secure computer system. Any details provided will never be shared without prior authorisation. If during the guarantee period the IBA becomes irreparable, we will exchange the defective product or any defective part with a replacement at our sole cost. The Guarantee on the replacement product will run continuously from the original purchase date of the original product. Notwithstanding anything to the contrary, should any person other than an authorised representative of VestGuard attempt a repair to your IBA, the Guarantee will be invalid. This Guarantee covers the IBA for normal use only. Any repairs of replacements due to fair wear and tear, excessive use or misuse will not be covered under the Guarantee. This Guarantee covers the IBA only if returned will labels displaying date of manufacture and provided by VestGuard UK showing the original invoice. Any parts found not to comply will not be covered under the Guarantee. (a) These conditions supersede all prior representations or arrangement and contain the entire agreement between the parties in connection with the products (Unless otherwise stated on Seller’s order confirmation). All other terms and conditions, express or implied are excluded. None of the Seller’s employees or agents has authority to modify of supplement these conditions or to accept any order except on Seller’s official sales forms. (c) References to the products include materials of the Buyer once processed by the Seller and all product packaging. If Seller has not issued an order confirmation. “Seller’s order confirmation” means any document issued by Seller indicating the terms on which the products are supplied. (a) Delivery or dispatch dates quoted or requested are given or accepted by Seller in good faith but are not guaranteed unless stated so to be on Seller’s order confirmation. The buyer shall observe time frames and cut off periods listed by the seller for dispatching goods. (b) Delivery shall be made to the place(s) and by the method(s) specified on Seller’s order confirmation. (or if none, ex works). Buyer is responsible for un-loading. Buyer’s or its carrier’s receipt shall be conclusive evidence of delivery. (d) Buyer shall accept manufacturing tolerances accepted in the trade, and weights or quantities varying by not more than 8% from the contract weight or quantity, and shall pay pro rata for the actual weight or quantity delivered except in cases of manifest error. (e) Save for the purposes of Clause 3(e), 6(b) and 7, each delivery shall be treated as a separate contract, and partial deliveries are permitted unless otherwise stated on Seller’s order confirmations. Accordingly, failure to make any particular delivery, or any breach of contract by Seller relating thereto, shall not affect any remaining deliveries. (f) Buyer shall take delivery of the products by any date quoted by Seller to execute Buyer or (if none) within a reasonable time. Seller may deliver early where reasonable. Buyer shall be responsible for all storage and other costs relating to Buyer’s failure to comply with the contract. (g) Buyer shall promptly supply all information and assistance required for Sellers execute Buyer’s order. (h) If the products are sold FAS or FOD, an on-board bill of lading, a mate’s receipt or other document is proof of delivery alongside the vessel is convulsive evidence of delivery. If Seller or its carrier is unable for any reason to place the products on board ship upon their arrival at the port of delivery, a warehouse receipt for the products shall be treated as sufficient delivery. (i) If the products are sold CIF or C&F, a receipt bill of lading or way bill is conclusive evidence of delivery. (j) Seller undertakes to obtain any licence(s) required for the export of the products from the UK by the Seller. Buyer undertakes to comply strictly with the terms of any such licence(s) (including any requirement for US re-export consents) and will indemnify the Seller against any breach of such terms by the Buyer, its servants or agents. Where delivery by the Seller is to made outside the UK, any failure by Seller to obtain any such licence shall, unless due to any act of omission of the Buyer be treated as circumstances beyond the reasonable control of the Seller for the purposes of clause 5(a) below. Seller does not warrant that products sold to the home market will be eligible for export licences to any other destination and it is for the Buyer to make enquires as to the requirement for any such licences. Buyer shall obtain and comply with all other necessary licences, permits and consents. (k) Buyer shall fully respect any national security marking or classification applying to any product and shall comply with any directions of the competent UK authorities as to the use, storage, transportation or disposal of any product to which such marking or classification may apply. (I) In the event of delays caused during delivery, Seller shall not be liable for any charges incurred if the fault lies with the shipping agent, or the buyer failing to supply relevant paperwork for clearance. In the event of such delays the charges will not be paid by the Seller, and must be incurred by the Buyer if the goods are to continue their journey. (J) Local taxes, duties, storage and other related charges are the buyers responsibility to pay and are not included in any shipping quotation provided by the Seller unless requested. (K) Seller will where possible confirm delivery details. If however Buyer provides incorrect delivery information any loss of goods as a result in supply to an alternate address to the Buyer, the Seller is not liable for the costs incurred in resupply, or retrieving the goods which the buyer has purchased. (L) Unless otherwise arranged, delivery will only take place once Buyer has paid for the goods in full. (M) Seller has the right to charge storage costs per week at their discretion for any delays in dispatching goods from their warehouse as a result of delays from the Buyers side. The seller will be responsible for collection, additional UK customs inspection/security fees (where applicable), shipping and delivery but WILL NOT be responsible for payment of any duties, taxes, storage, local customs inspection fees that may be applicable or any other costs arising from the shipment that may not have been predictable at the time of original quotation or shipping. The seller will be responsible for collection, additional UK customs inspection/security fees (where applicable), shipping and delivery AND WILL ALSO be responsible for payment of all duties, taxes, storage, local customs inspection fees that may be applicable, along with any other costs arising from the shipment that may not have been predictable at the time of original quotation or shipping. NB. These terms are for consignments moving within the EU. Seller cannot accept contracts under these terms outside of the EU as they open the seller up to unpredictable costs at the receiver’s end which the seller has no control over. The seller will be responsible for collection, additional UK customs inspection/security fees (where applicable) and shipping but WILL NOT be responsible for payment of onward delivery, duties, taxes, storage, local customs inspection fees that may be applicable or any other costs arising from the shipment that may not have been predictable at the time of original quotation or shipping. (a) Unless otherwise stated on Seller’s order confirmation, prices are ex works and exclusive or VAT and all other duties, fees or taxes. All sums due to Seller shall be paid in the currency and to the address stated on Seller’s order confirmation, or such other address as Seller may require. Unless otherwise stated on Seller’s order confirmation, payment is due 30 days following date of invoice, but Seller may require security for payment before despatch in the circumstances described in Clause 6(s). (ii) Retail purchases are paid upon confirmation of order, and goods will be dispatched once confirmation of payment has been made and goods are available to send. (iii) International Buyers are subject to multiple options of payment in accordance with Seller quotes and terms are provided for each option. In all International shipments, unless stated, full payment must be received and cleared in to Seller account before goods can be shipped. Payment from Buyer should be timed to coincide with delivery of goods to Seller from the factory as delays due to late payment and/or funds clearing into account are of no fault of the Seller. (c) Where prices are quoted in currencies other than sterling. Buyer shall compensate Seller for any currency losses suffered by Seller as a result of Buyer’s failure to pay for the products on the date specified in Clause 3(b). (d) Unless prices are stated to be fixed on Sellers order confirmation, Seller may increase prices in accordance with increases in Sellers costs and or general price list increases occurring after the date of Seller’s order confirmation before despatch. Buyer shall pay for any increases in delivery costs after the date of Seller order confirmation. (e) In the circumstances described in Clause 6(c), all unpaid balances owing to Seller from the Buyer shall become a debt immediately due and payable to Seller, irrespective of whether property in the products has passed to Buyer. (f) Payment is of the essence of the contract. Seller may charge interest at 8% above Barclays Bank plc’s base rate per annum for the time being (to accrue from day to day) on any sum owed to Seller under the contract which is not paid on the date specified in Clause 3(b) after as well as before any judgement. Buyer may not withhold payment or make any set-off on any account. (a) Any quotations provided by the Seller are done so under the terms and conditions on this website. By placing an order from a quotation, the Buyer agrees to these conditions if the quotation supplied refers to the website. (b) Any validity periods specified are final, and after such validity, the Seller may increase, or decrease any quotations in accordance with any variation in prices between the date of quotation and the expiration date. (c) Any delivery periods specified by the Seller are given in good faith and may vary immediately after quotation submission without notice. All attempts will be made by the Seller to meet any delivery quoted, but will provide updates should any delay become apparent. Seller is not liable for any delays which are out of their direct control. This includes but not limited to acts of god, raw material or sub contractor delays, adverse weather conditions, death or injury, holiday periods and delays as a result of Buyer response times. (ii) comply with Seller’s current published product data sheets (or, where there are none, that they comply with any specification appearing on Seller’s order confirmation and are made with sound materials and workmanship to normal standards accepted in the industry) in all materials respects. SELLER DOES NOT WARRANT THAT THE PRODUCTS ARE FIT FOR ANY PARTICLUAR PURPOSE OF OR INTEDED USE BY BUYER, AND IT IS FOR BUYER TO SATISFY ITSELF THAT THE PRODUCTS ARE SO FIT. Buyer shall (Subject to Clauses 4(f) and 8 (a)) be treated as having waived all claims connected with the matter which should have been notified. (d) Subject to notification within the period required by Clause 4(c), if it is shown to Seller’s reasonable satisfaction that the products fail materially to comply with the Seller’s Warranty, Seller shall be given a reasonable opportunity to correct such failure, and, if Seller does not or is unable to do so, Seller will at Buyer’s option either refund the price paid by Buy (or, if the products have depreciated for reason other than Seller’s default of have been used or put into process a reasonable part of the price), or replace the products (if reasonable practicable) within time, free of charge (excluding materials not supplied by Seller). SUCH CORRECTION, REFUND OR REPLACEMENT SHALL, SUBJECT TO CLAUSE 4(f) BELOW AND TO CLAUSE 8(a). BE SELLER’S SOLE LIABILITY IN RELATION TO ANY SUCH FAILURE. Replacement products are covered by these conditions, including Seller’s Warranty. Products which are alleged not to comply with the contract shall as far as possible be preserved for inspection by Seller, and if replaced or if a refund is made shall be returned to Seller (at Seller’s cost) if Seller reasonably so requests. (e) Clause 4(a) (ii) and (iii) do not apply to seconds, remainder stock or samples or to goods sold as obsolete or sub-standard, nor do they apply to the extent that any alleged defect shall be attributable to any material of the Buyer furnished to the Seller for processing or incorporation into the products, and Seller shall be under no duty to examine any such material prior to such processing or incorporation. (g) In any circumstances described in Clause 4(f) Buyer shall promptly notify Seller of any relevant claim, shall comply with the Seller’s reasonable requirements to minimise liability and/or settlement negotiations. (a) Seller shall not be liable for nay failure to comply with the contact related to any circumstances whatever (whether or not involving Seller’s negligence) which are beyond Seller’s reasonable control and which prevent or restrict Seller from complying with the contract. (b) Seller may where reasonable in all circumstances (whether or not involving Seller’s negligence) without liability suspend or terminate (in whole or in part) its obligations under the contract), if Seller’s ability to manufacture, supply, deliver or acquire materials for the production of the products by Seller’s normal means is materially impaired. (a) Except where Buyer has caused or contributed to any delay, Buyer may (as Buyer’s sole remedy, without affecting the balance of the contract quantity) terminate the contract by notice to Seller in respect of any instalment of products which is not despatched. (ii) Within 90 days after any date quoted on Seller’s order confirmation (unless the goods have been specifically manufactured or adapted for Buyer). (b) Seller may (without prejudice to its other rights or remedies) terminate or suspend Seller’s performance of the whole or any outstanding part of the contract in the circumstances described in Clause 6(c). Seller may also suspend deliveries while investigating any claim relating to prior shipments (under any contract) of products. (iii)Seller has reasonable grounds for suspecting that an event in Clause 6(c)(ii) has occurred or will occur, or that Buyer will not pay for the products on the due date, and so notifies Buyer. (d) If Buyer provides Seller with security for the contract price, reasonable acceptable to Seller, within 3 working days after a notice has been given under Clause 6(c)(iii), Seller shall withdraw the notice. (e) Delays in obtaining any permission or export license are not grounds for termination by the Buyer if products have been manufactured by the Seller to meet Buyer requirement and specification. (f) In the event goods are delivered within the UK awaiting export authorisation, these may not be returned for a refund if authorisation is delayed or rejected. Unless subject to any conditions of warranty or guarantee. (i) Indication of a return must be identified within 7 days after the day the items are received, and returned within 14 days to be eligible for a refund of the value of goods. (ii) You have the right to cancel orders within seven working days beginning the day after the day on which you receive the goods. (iii) If you wish to cancel this contract you must indicate this in writing or another durable medium such as letter, fax, or email within the cancellation period. (iv) You (the consumer) have a statutory duty to take reasonable care of the goods while in your possession. (v) You (the consumer) must arrange for the safe return of goods to VestGuard, the cost of which is to be borne by you, failing which VestGuard will recover the goods, the cost of which will be deducted from any refund due to you. (vi) On the cancellation of a contract the supplier shall reimburse any sum paid by or on behalf of the consumer under or in relation to the contract to the person by whom it was made free of any charge (less any charge made in connection with recovery of the goods) within 30 days of cancellation. (viii) Any returned goods received without notice may be returned or refunded at our discretion. A small restocking fee may be charged if received without notice or cancelled after seven working days. Please note if the item returned is used more than reasonable care, damaged, soiled (stained, impregnated by smoke, written in) or altered, it is not eligible for return. Shipping, including return shipping, is the responsibility of the customer. Any Express or timed services chosen at checkout other than standard delivery options are considered an additional contract and therefore are none refundable. The cost of standard delivery will be refunded on return at the rate listed on our website. (ix) We cannot accept returns for the supply of goods made to the consumer’s specifications or clearly personalised. (x) Return of goods purchased is covered by the Distance Selling Regulation Act 2000 for online purchases. Return of goods purchased in any way from VestGuard outside of the allotted 7 day notification period will be subject to a 15% restocking fee which will be deducted from the returned value of the items by the original method of payment. Original Postage is non refundable after the 7 day notification period. (a) (i) All material of the Buyer which may be consigned to Seller’s premises for processing shall at all times be at Buyer’s risk, and Seller shall not be liable for loss or damage thereto, whether or not involving negligence by Seller. (ii) In addition to any general lien, Seller shall, in the circumstances set out in clause 6(c) have a lien on all goods of the Buyer in its possession (even if these shall have been wholly or in part paid for), in satisfaction of the whole or part (as the case may be) of the unpaid price of any product delivered to the Buyer under the same of any other contract. (b) Risk/title in the product shall pass to Buyer upon delivery. (d) As a separate and independent condition, Buyer agrees that in the circumstances described in Clause 7(c)(ii), the resulting product (“the Downstream Product”) shall be Seller’s property until the conditions in Clause 7(c)(i) or (ii) have been met, unless the value of the other goods (as measured by the price charged to the Buyer or, if none, the direct factory cost to the Buyer of their manufacture) exceeds the contract price for the products. (e) Until ownership of the products or Downstream Products passes to Buyer, Buyer shall insure them against all usual risks to full replacement value, shall sell, use or part with possession of them only in the ordinary course of trading, and shall where reasonable possible keep each delivery separate and clearly identified as Seller’s property. In the circumstances described in Clause 6(c), buyers rights to sell, use or part with possession of the products or Downstream Products shall terminate, and Seller may recover and/or sell the products or Downstream Products and may enter Buyer’s premises for that purpose, without prejudice to Seller’s other remedies. If Seller recovers and/or sells the Downstream Products, any excess of the value of the Downstream Products (as reasonably estimated by Seller) over any amounts due to Seller under the contract plus Seller’s costs of recovery and disposal, shall be paid to Buyer. This obligation shall survive termination of the contract. (a) Seller will defend Buyer against any third party claim made against Buyer in the United Kingdom alleging that the products as such, in the original state sold by Seller, infringe any patent, registered design, trademark, tradename or copyright effective in the United Kingdom, and Seller will pay any damages and costs finally awarded against Buyer in the United Kingdom in respect of such a claim. Seller may modify the products to that they cease to infringe so long as Buyer is not substantially prejudiced by the modification. (ii) IN RELATION TO ANY THIRD PARTY CLAIMS ARISING FROM THE USE MADE OF OR DEALINGS BY BUYER IN THE PRODUCTS (IRRESPECTIVE OF WHETHER THEY INVOLVE THE NEGLIGENCE OF SELLER, ITS AGENTS OR EMPLOYEES), EXCEPT AS PROVIDED IN CLAUSE 8(a) AND 4(f) OR IF ARISING FROM SELLER’S SILFUL DEFAULT. SELLER SHALL NOT BE LIABLE, IN CONTRACT, TORT OR OTHERWISE, AND IRRESPECTIVE OF THE NEGLIGENCE OF SELLER, ITS AGENTS OR EMPLOYEES, FOR ANY REPRESENTATIONS, ADVICE OR ASSISTANCE GIVEN (UNDER THIS CONTRACT OR OTHERWISE, AND WHETHER BEFORE OR AFTER THE DATE OF THE CONTRACT). UNLESS AND THEN ONLY TO THE EXTENT THAT SELLER HAS MADE SUCH REPRESENTATIONS, AND/OR AGREED TO PROVIDE SUCH ADVICE OR ASSISTANCE, FOR A FEE UNDER A SEPARATE WRITTEN CONTRACT WITH BUYER. (i) IN NO CIRCUMSTANCES WHATEVER SHALL SELLER BE LIABLE (IN CONTRACT, TORT OR OTHERWISE, AND IRRESPECTIVE OF ANY NEGLIGENCE OR OTHER ACT, DEFAULT OR OMMISSION OF SELLER OR ITS EMPLOYEES OR AGENTS) FOR ANY INDIRECT OR CONSEQUENTIAL LOSSES (INCLUDING LOSS OF GOODWILL, BUSINESS OR ANTICIPATED SAVINGS) LOSS OF PROFITS OR USE, OR (SUBJECT TO CLAUSES 4(f) AND 8(a)) ANY THIRD PARTY CLAIMS, IN CONNECTION WITH THE PRODUCTS OR THE CONTRACT. (ii) EXCEPT AS PROVIDED UNDER CLAUSES 4(f) AND 8(a), SELLER’S TOTAL AGGERGATE LIABILITY IN CONNECTION WITH THE PRODUCTS OR THE CONTRACT (IN CONTRACT, TORT OR OTHERWISE AND WHETHER OR NOT RELATED TO ANY NEGLIGENCE OR OTHER ACT, DEFAULT OR OMISSION OF SELLER OR ITS EMPLOYEES OR AGENTS), IS LIMITED TO THE CONTRACT PRICE, EX-WORKS AND EX-VAT. (d) WITHOUT PREJUDICE TO CLAUSE 4(c), NO ACTION MAY BE BROUGHT AGAINST SELLER IN CONNECTION WITH THE PRODUCTS OR THE CONTRACT UNLESS PROCEEDINGS ARE ISSUED AGAINST SELLER WITHIN TWO YEARS AFTER BUYER BECAME OR OUGHT TO HAVE BECOME AWARE OF THE CIRCUMSTANCES GIVING RISE THERETO. (e) THIS CLAUSE 10 APPLIES NOTWITHSTANDING ANY FUNDAMENTAL BREACH OF A FUNDAMENTAL TERM OF THE CONTRACT BY SELLER. (a) Buyer shall ensure that all products are safely and lawfully received, stored and maintained, used or applied by Buyer and that Buyer obtains relevant information in Seller’s possession relating thereto. (b) Notices must be in writing to Seller’s or Buyer’s address and are deemed delivered on the first working day after sending by hand or (subject to confirmation of transmission) by telex or facsimile, or, within the UK, on the third working day after being placed prepaid in the first class post to Buyer’s or Seller’s UK address. Qualified acceptances by Buyer on delivery notes shall not constitute notice of any claim or acceptance by Seller of any such qualification. (e) VestGuard will aim to manufacture all products in the UK where possible. We reserve the right to use our overseas suppliers and manufacturers when required. This contract shall be governed by and construed in accordance with the law of England. Buyer hereby agrees, for Seller’s exclusive benefit, that the English courts shall have sole jurisdiction to hear all claims or proceedings.